We’ve all seen the numbers on potentially avoidable Medicare readmissions, but new penalties from CMS for subpar readmission rates pack a little more punch into these often-published stats from CMS, the AHRQ, MedPac, and other sources. The hard truth is that more than 2,200 hospitals will lose a portion of their inpatient Medicare rates in FY 2013. Proactive data analysis is one way to keep readmissions penalties at bay. And this new infographic from the Healthcare Intelligence Network consolidates the protocols and strategies many organizations are using to dramatically reduce the number of Medicare beneficiaries that return to the hospital within 30 days, drawing from responses from our annual Reducing Hospital Readmissions survey. Upping use of telehealth and fall risk assessments. We invite you to embed this infographic on your own Web site using the code that appears beneath it. Also, share it via your social media channels. A deeper dive into the latest trends to reduce hospital readmissions is reflected in 2012 Healthcare Benchmarks: Reducing Hospital Readmissions. 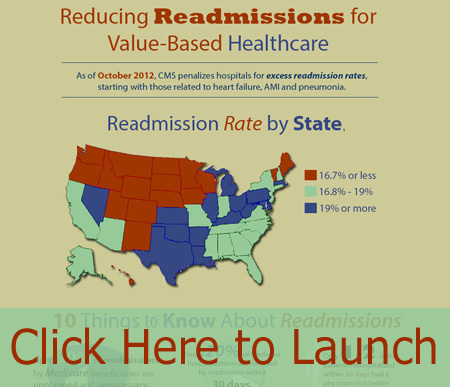 This entry was posted on Wednesday, December 12th, 2012 at 1:30 pm	and is filed under Case Management, Hospital Readmissions, Infographics, Medicare, Reducing Readmissions, Transitions in Care. You can follow any responses to this entry through the RSS 2.0 feed. Both comments and pings are currently closed.